Not everyone loves spending time with their family. For some, the thought of extracting an afternoons conversation from their parents, sibs, aunts, uncles and cousins is akin to extracting a fingernail without anaesthetic. To choose to spend a weekend with them, well that would just be madness. Of course, there are also many who look forward to any opportunity to spend some time with the near and dear. Like that last easter egg in a ten year old’s hand, I’d love to be able to hold on to those days when the family get together, because like the egg the days are smooth, they are sweet & they seem to go all too fast. Such was friday night and Saturday. Were you to ask my Grandparents (who shall henceforth be referred to as Granny and Bamma), they might say that they feel the same way about the last 60 years! That’s how long they have been married! Two continents (Granny being English, Bamma being an Aussie), a courtship in war, three kids, lots more grandkids, a business built in Camelias, a thousand happy occasions and, I’m sure, a handful of grieving moments. A million little experiences, some savoured, some missed, all now past. It is an occasion. It is reason for celebration. 60 years! 20-odd family members slip up to the Hunter Valley for the weekend. I pick up my sister Amy & Beth, her youngest, from the airport & then we drive up to join the festivities. Of course we’re excited. We’re spending time with those we love. Not everyone loves spending time with their family. But we do. These occasions are so many things to me. They are quiet beers, casual chats, tossing around a footy, or yelling out hopefully “one hand, one bounce” as we play backyard cricket. It’s almost 30 years of my life. Memories for my parents, memories of mine & now becoming memories for my nieces and nephews. For us it has been something we do, a part of who we are. Well, my hope for Granny and Bamma (Granny I know you read this blog) is that they have enjoyed the weekend, knowing that it is not just something they do, but something they have made! Bamma can no longer really walk & Granny essentially looks after him full-time, but they don’t have to run around to enjoy this. Granny & Bamma. Sit back, grab another glass of red & enjoy watching the fruit of your labour! Your family love each other because you loved us first! It’s not every day that you get a letter from the Queen! 4 generations. From L to R Anne, Amy, Beth, Kristin Charlotte & Granny. 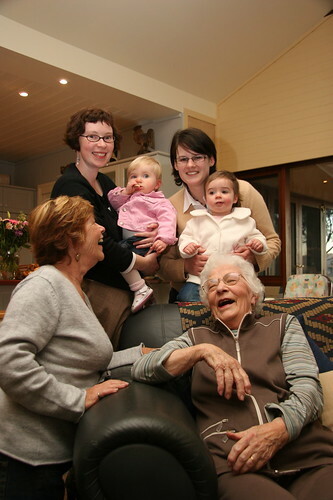 I love the 4 Generations photo, especially your grandmother laughing. So cool. You realise how lucky you are to have such a great family that you can hang with no pressure right? Yea, I can tell from this blog you do. Can i just say that is so refreshing to read, such genuine excitement to spend time with family is sadly rare! All my family is in NZ and i sadly only have one grandparent still with us, so i totally understand how precious those family gatherings are! Continue to treasure them as you have been Tim! I also really love that 4 generations photo – very cool! 60 years, that is reason to celebrate. 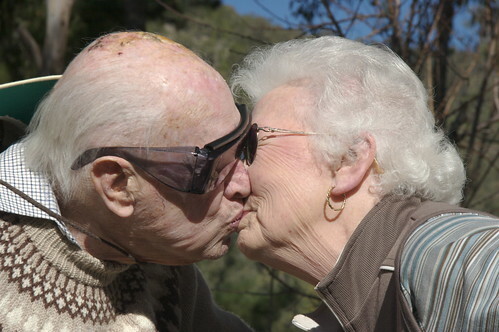 The picture of your grandparents smooching is so sweet! It sounds like you had a magnificent weekend – you write about it so lovingly. I too love the photo of the 4 generations. PS. Kristin – you’re looking fabulous! 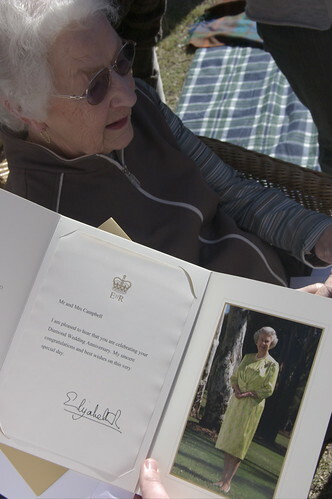 does anyone else think it’s weird that when the queen sends you a letter, it has a giant photo of her in it? congrats to your family, what great photos. my parents are approaching 60 years maried also and I would like to know how to go about organising the letter from the Queen, any info would be much apprecuated.